For the longest times, one of the slipperier questions about the in-the-works next Terminator movie was whether it’s a reboot or not. After all, it’s got brand-new people playing the core trio of Sarah Connor (Emilia Clarke), adult John Connor (Jason Clarke), and Kyle Reese (Jai Courtney), but Arnold Schwarzenegger is also returning to the role of a Terminator cyborg, in spite of very obviously looking several decades older than he did in James Cameron’s original film. Recent descriptions of Terminator: Genesis suggested it would tell a new story with the characters, but one which weaves in and out of the events of the earlier films. Now a look at the script has revealed that Genesis will be pulling a few tricks from Back to the Future Part II’s playbook. Kind of like Back to the Future, the Terminator: Genesis script folds into the first film in the series….There’s a scene in the script where literally, we see the scene in the first Terminator where Arnold steps out, the punks threaten him, he rips Bill Paxton’s heart out and takes his clothes and wanders off. And as soon as that scene ends, another Arnold Schwarzenegger who’s older, and bearded and a very different version of the Terminator, comes walking in from the other side and plays another scene, right at the scene of that first incident. 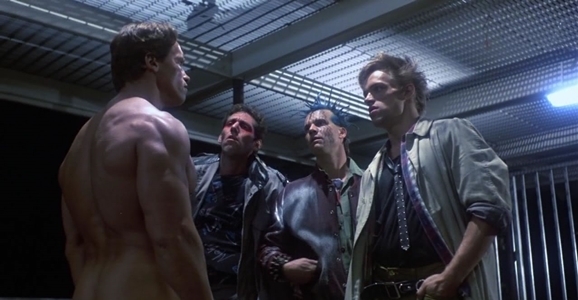 I’m betting the new take on the famous “Give me your clothes” moment will be early in the movie, perhaps even the scene that first introduces us to the older T-800. That’s pure guesswork on my part, but I can see that being a striking way to introduce Arnie’s new/old model. Here’s hoping they’ve figured out a way around that “nothing dead will go” rule, because I simply don’t need to see Arnie’s 66-year-old bare backside at this stage in my life. At any rate, it does make me curious to see what other established Terminator sequences will get the Back to the Future treatment. Maybe they’ll have a new action set piece unfolding in the background of T2’s infamous truck chase. Hopefully the script won’t go overboard with the concept, though. A little of that can go a long way, and in order to refresh the franchise, Genesis is going to need to be able to stand on its own, not just rely on nostalgia. Someone didn’t watch the clip – Bill Paxton isn’t the one getting his heart ripped out. That’s just lazy writing. yeah bill Paxton is not the guy Arnold took the close from it is from the third guy on the left. It’s a joke surely to use the Back To The Future method.. Besides that was a comedy in BTTF 2. They should’ve recast or redesigned the Terminator so it wore a mask of some kind. That way it could never age.